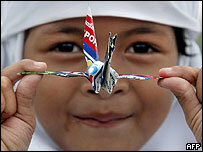 The Thai government has dropped an estimated one hundred million paper origami birds in an unusual peace bid. The birds were dropped by military planes over the country's Muslim south after a surge of violence in the area. But those critical of the campaign say it will not solve the complex problems that have caused the violence. The "peace bombing" was scheduled to coincide with the 77th birthday of revered king, Bhumibol Adulyadej. As the birds fell to their targets in the provinces of Narathiwat, Yala and Pattani, school children rushed out to collect them and seek the notes inside. Mr Thaksin has promised that the student who finds it will win a scholarship. It was difficult to avoid the flurry of folding ahead of the weekend's bombardment. It was inspired popular politics from a government that has faced severe criticism over its handling of the crisis in the south. Mr Thaksin publicised the idea about two weeks after an incident that shocked the nation. After demonstrations near the Thai-Malaysian border, close to 80 Muslim protesters suffocated when they were taken into custody and piled one on top of another into army trucks. The government blamed insurgents for inciting violence but critics blamed an over-zealous response by security forces, whom they accuse of fighting a self-appointed war on terror. The Muslim majority in the south appeared bemused by the idea of the aerial onslaught of paper cranes. But, while reluctant to reject any goodwill, they said a political solution would have more meaning to a crisis that has claimed the lives of more than 500 people so far this year. Special prayers for peace were also held in mosques across the south of Thailand.